See, this is how you react to a present. Jacob loved his gum. He loves gum, but we usually don't let the kids have it. I find it in all sorts of place that it doesn't belong. On my shoe. In my carpet. On my dishes. Under my table. On toys. In hair. I wonder why they don't get gum more often! 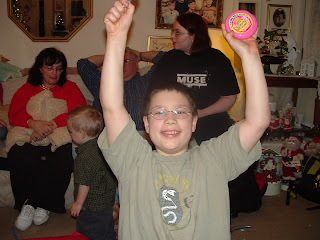 But anyway, he was really excited about the gum. I think it was all gone by the next day, but he did like it. And what I liked the best, was that they both were so open to sharing. They went around asking if everyone wanted some. What giving kids!